Yippee, back to regular blogging! I found this great new calling site called Child's Play Challenges. The challenges are based on children's books, toys, games etc. How fun! I like it because I can choose any element from the item for my inspiration. I think that really works for me and the way I scrap. I have already finished scrapping all my photos of my boys in their Cozy Coupe, so I took my cue from the colors in the photo, red, yellow and blue with a bit of black. I had these photos of my older son and I at Disneyland. The red shirt and blue balloon were easy to work with. I love primary colors, and having boys, I use them frequently. I spent a lot of time making the pinwheels. 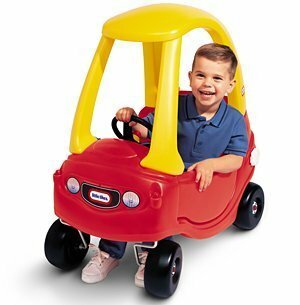 Iused them because they move like the cozy coupe! I started with a Scrapbook Generation sketch. DCWV Cardstock, Echo Park and TPC Studio patterned paper, Doodlebug twine, random buttons and Authentique letter stickers. Amazing page Derv! I love the banners with the ears and the pinwheels. Awesome job! So glad you found us at childs play. Love your take on the cozy coupe. ohhh I LOVE LOVE all the pinwheels!!! such a fun 2 pgr!!! way to go!! thanks sooo much for playing along with Child's Play blog!!!! loving! absolutely love the banners and the mix of Mickey heads in there! I'm a HUGE lover of all things Disney! Welcome to Child's Play!! So glad you found us!! Love your take on our challenge this week - you really did an awesome job with the colors and what a fun layout! Thanks for joining us at Child's Play!